This is our first official foray into the world of The Magic Tree House. We were gifted a copy of a later one in the series but it was slightly confusing as it was clearly later on in the series. I finally got around to remembering to pick up Book #1 at the library last week. If you are unfamiliar with The Magic Tree House books (as I was), the books follow the adventures of two siblings, Jack and Annie, who live in Frog Creek, Pennsylvania. 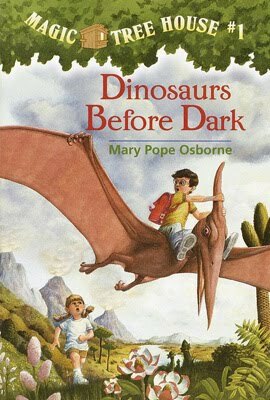 If you start with Book One - Dinosaurs Before Dark - you find Jack and Annie discovering a tree house in the woods nearby their house. They do not know who the tree house belongs to but upon exploring it, they discover a pile of books inside. One of the books contains a map of their hometown, although they do not note its significance at first discovery. Jack also finds a book containing information about dinosaurs and as he is looking at the book, he says, "I wish I could see a Pteranodon for real." All of the sudden, a Pteranodon is seen flying right outside the window of the tree house. The two children find themselves transported to another world. The only way that they can get back home is to stare at the book with a map of Frog Creek, Pennsylvania and wish to see it again. As you might imagine, they wish to see Frog Creek fairly quickly after bumping into a huge T-Rex! And so the stage is set for this series of books. Jack and Annie find that they can go to any number of places, at any time in history through the magic tree house. Also, in their travels they begin finding clues to who owns the tree house. How this all unfolds, I have no idea. As I said, we picked up Dinosaurs Before Dark this past week to give these books a test run and see what we thought. Bookworm1's take (as interpreted by Mommy): The story was enjoyable and entertaining. Each chapter ends with something of a cliff hanger which kept him wanting to "read one more!" We finished the entire book in about 45 minutes, so he was pleased. He thought the story was fun and is interested in picking up additional titles. Particularly any which relate to dragons. Mommy's take: The chapters are short, quick and easy. Illustrations are liberally strewn about which kept Bookworm1's (age 6) attention, as well as Bookworm2's (age 4) who kept running over to see what was on each page spread. Having read two of these books now, I would say that I have an opposing worldview from author Mary Poe Osborne. In this particular title - Dinosaurs Before Dark - she ascribes to the idea that dinosaurs have been extinct for millions of years. She also describes what one of the dinosaurs skin felt like, which is pure speculation. However, she presented it as fact which I found a little disturbing since, especially when children are younger, they want to know what is true and what is imaginary - specifically! I didn't care for her stating as facts things which we can only guess. The other title which I read (and no, I'm not going to point out which one it was) was a history title and was very politically correct. Neither of these two "problems" which I have with the books will make me request of my son that we avoid the series. I don't mind reading them because they are rather exciting. However, I am glad to keep The Magic Tree House books as read alouds so that we can discuss them as we go and talk through any areas where I might have a disagreement with the author. I don't think we'll devour this series either. I can see us picking up a title or two of interest, when the mood strikes. But we should have a well-rounded reading diet which includes more than just these, for sure and certain! They aren't my favorite, and they aren't my least. But they are fun and I can see the appeal. Especially for new readers who are delving into chapter books. If I were grading the books, I'd probably give them a B-. Imaginative! Fun! But I disagree with the worldview of the author and that distracts. Have any of you had any experience with this series? Any particular title you would recommend that we read, or possibly avoid all together? I'm curious to know! Fun every now again - but not a main part of the diet. That sums it up well. My daughter liked them so-so the first time she read one (when she was maybe about 6? )...then all of a sudden decided she really liked them last summer at age 8. The nice thing about her deciding she liked them as a bit more experienced reader is that she blew through the whole series in one summer. Nice, light "sit in a tree on a summer afternoon and read a book" sort of reading. ;-) My daughter says she thinks they get less "historical" and more "magical" as the series goes on -- not that they all aren't magical to some degree, but she thought she learned more about real historical time periods in the first couple dozen books than in some of the later ones. My kids have read quite a few of them, but they read other things, too. Most of them are within historical time, so you won't have the same issues as in the dinosaurs one. Although there is a bit of magic, obviously. I personally refuse to submit myself to the agony of pre-reading early chapter books, so I give it a quick flip-through and call it a day. If the sentences don't want to make me run screaming and stabbing things in my eyeballs, and if I don't see obvious anti-parent or anti-heroism themes, then I will probably give it a pass and encourage better literature in what I read to them and what they listen to on CD. I haven't read any of them, but I've been curious what you thought of them. I used these to get my kids reading and they quickly outgrew them. My biggest complaint with them is how they portray Morgan le Fay as a good person. I have had numerous conversations with my daughter telling her that in the actual King Arthur retellings that Morgan le Fay is not a nice person. So now that has made her think the King Arthur stories are terrible.